This entry was posted on Tuesday, March 15th, 2011 at 20:53	and is filed under American Ale, Strong Beer. You can follow any responses to this entry through the RSS 2.0 feed. You can leave a response, or trackback from your own site. Wow. I couldn’t disagree more. The one I had was very good. 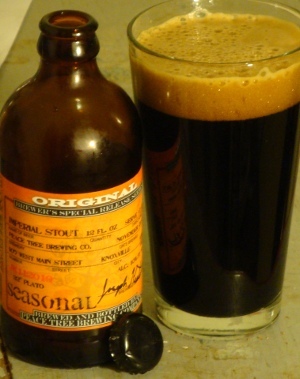 Similar to the Gumbo Stout but much richer. I’ll have to go back and try another one. Is yours the same batch as mine (JK112010)? I will also certainly try another one. Anybody have a batch that’s not JK112010? I’ll gladly trade any of my highly coveted cellared beers for a different batch. I’ll have to check. I’ve bought bottles at two separate locations (Johncy’s in North Liberty and Dirty John’s). All my bottles are from JK112010 as well.